This is a full day certification course for new or somewhat experienced off road riders. 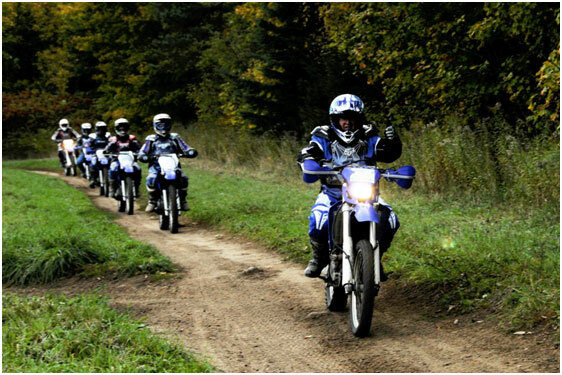 The lessons are designed to give riders lots of safe, practical riding experience on our or their own off road bike. The goal at the end of the day is that students leave with their certificate having mastered the basics of safe operation of a dirt bike. No motorcycle riding experience is required but, good bicycle riding skills are a prerequisite! We provide full riding gear and take time to explain why it should be worn riding off road. We have a fantastic area for the start riding lessons and great trails to practice your new found skills. Our patient and very experienced instructors love helping new riders enter our sport safely! In the past twenty years we have taught over 60,000 off road customers (age six and up). There is a risk of injury when riding off road but, we are very proud of our safety record. In twenty one years we have called only nineteen ambulances. Our courses run Tuesdays, Thursdays, Saturdays and Sundays from 8:30 AM to 4:30 PM. Please visit our PRICING section for costs of the Canada Safety Council Dirt Bike Program Certification.